A beautiful handmade baby scrapbook made from scratch, is the perfect size to display your baby's first events! The book can be used to display photographs or acknowledge written milestones in your child's life. The album displayed is covered in two (2) fun fabric selections of your choose. 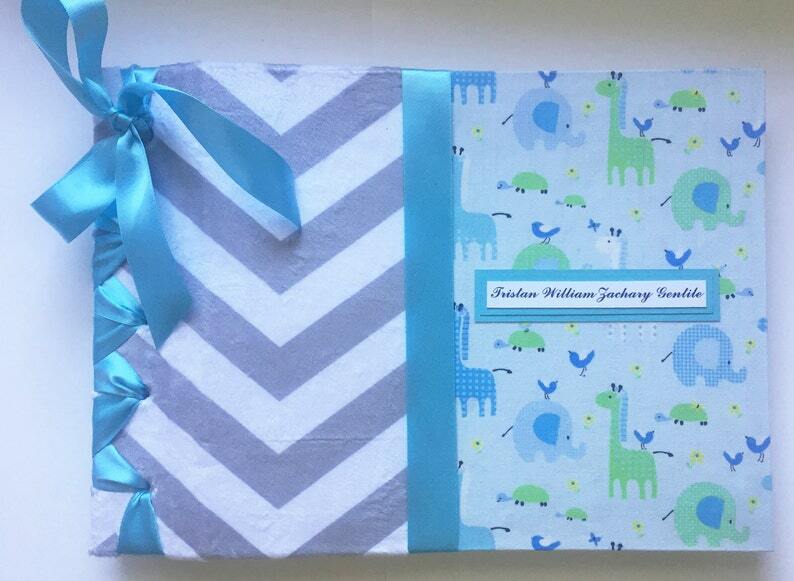 (Mink chevron grey and white fabric and baby blue giraffes and elephants). How it works is that you contact me and I will give you a selection of fabrics you can choose from in order to create your personalized design! ****PLEASE ALLOW 3-4 WEEKS FOR YOUR BOOK TO SHIP**** If you need it sooner please contact me for an estimated ship date before purchasing. The album consists of 25 solid sheets of 130lb cardstock in the color of white, ivory or black. The pages are each hinged individually with satin tape to allow the book to lay flat when open for display. The entire book size is 14" x 17" and the page sizes are 13" x 13". At the time of check out, please include this short questionnaire in the message to seller selection. Thank you! 1) What fabric style would you like to use for the album? 2) What is the the baby's name? 3) What color would you like the satin ribbon to be? 4) What color would you like the cardstock to be? Ivory, White or Black? 5) Address to ship the book to is it the same as listed in your Paypal account? If you are interested in adding additional pages please convo me before purchasing - additional cardstock pages are $2.00 for each. Allow 3-4 weeks for completion and 2-3 days to ship in the US, 14 days to ship outside the US. Contact me for "RUSH ORDERS" options which is an additional $35.00. The album was beautiful ! It was exactly what I had asked for. Seller was quick to respond to any questions I had. Very happy with product.